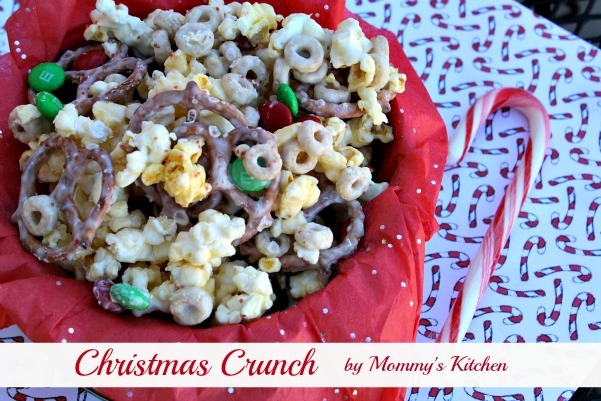 This popcorn mix is my number 1 treat to make during the holidays. Last year for 4th of July I made Patriotic Popcorn and for Easter it's always Easter Bunny Munch Mix. 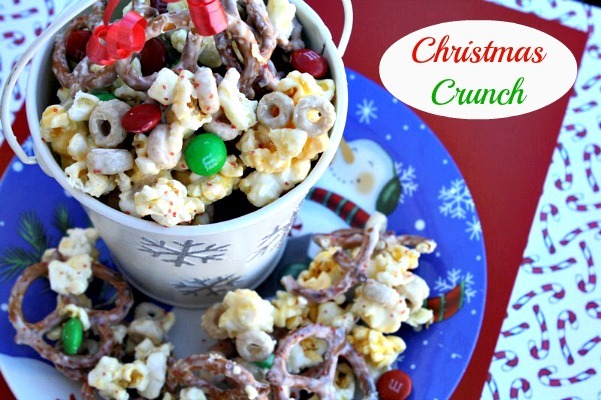 I thought it was only fitting to make a Christmas themed popcorn, so yesterday I tossed together a Christmas Crunch Mix. Christmas Crunch is perfect to put into cute holiday themed bags to give to teachers, friends and great for parties. I was in charge of treats for Carson's Cub Scout Christmas party, so I thought this popcorn mix along with some cookie bars would be fitting. I like to add peanuts from time to time, but one of the kids has a peanut allergy. When that issue comes up I usually just substitute with plain Cheerios. This snack is always a huge hit with all the kids as well as with the adults. Everyone thinks it's hard to make, but literally it takes only about 10 minutes to throw together. Once the popcorn mix set up I added it to festive party bags and added a candy cane to each one. Christmas Crunch also fits perfectly into a Christmas tin with pretty tissue paper. If you're looking for a last minute treat idea I think you'll love this recipe. Pop the popcorn and remove any un popped kernels. Place pop corn, pretzels and Cheerios in a large bowl and set aside. Unwrap and break the vanilla bark into smaller pieces. Add the vanilla bark to a microwavable bowl and melt on the DEFROST setting on your microwave. Don't use the cook or reheat setting or you will cook the almond bark instead of melting it. Melt the bark in 3 minute intervals and stir in between. When the vanilla bark is completely melted and smooth pour over the popcorn mix. Using a large spoon mix together coating the popcorn and pretzels evenly. Spread the popcorn mixture on a piece of waxed paper until the popcorn is dry. Add the festive sprinkles and half of the m&m's so they stick to the popcorn mixture. When dry break into smaller pieces and add back to a large bowl. Mix in the remaining m&m candies and place popcorn mixture into holiday themed bowl or individual treat bags tied with ribbon. yum had to pin this. YUMMY! YUMMY! I make something similar...with cereal. I think this is an awesome way to use up the 'last' of ingredients like this that I have on hand. Thanks so much for sharing. Yum! Soooo delicious and quick & easy too!